We say hello to Tom Merrill the founder of Steel Ink Design, a graphic design company based in Sheffield. This is the 3rd interview of the Web Branding Series, 2011. Firstly Tom, thanks for taking the time to talk to us today. From checking out your website and your facebook page I can see you have a great collection of work. What work have you undertaken in the past that you would say best demonstrates what Steel Ink Design is all about? I recently completed some work for a Sheffield based events company. They’re always on the look out for the next big thing in the promotion world in order to effectively reach their target audience. So I created a very simple flyer that contained nothing but a QR code. The whole concept was based around the idea of intrigue getting the better of you. The flyers were strategically placed around locations where they knew their target audience ‘hung out’ to entice them into scanning the code.If you want to find out who the company is, well, you’ll just have to keep your eyes peeled for one of the flyers and scan the QR code yourself! I understand that you’ve recently set up your own business, Steel Ink Design. What advice would you give to any of our readers out there that are thinking about going alone? Any tips for getting motivated, inspired, creative? I think it’s important to build up a library of design books and example work that you admire. There are always times when I’m working on a project and it seems as though it’s not progressing at all. I look through design books, get ideas, and see how other designers tackled similar issues. Then I go back to the work another time (I often leave projects 24 hours before looking at them again) and it almost seems blindingly obvious as to what I need to do after a break from thinking about it. Suddenly everything becomes clear and makes sense. 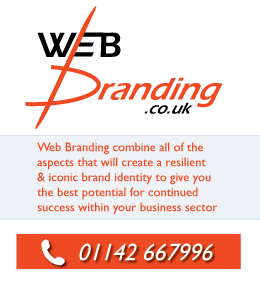 Whilst in the process of setting the company up, I found SENTA, the Sheffield Enterprise Agency to be invaluable. They’re a completely free government funded organisation. I received a lot of useful business support from the Sheffield Enterprise Agency, support that otherwise wouldn’t have been available to me. I’d recommend joining SENTA to anyone who is thinking of starting his or her own business in Sheffield. I see from your website that you’re a freelance graphic designer and a landscape architect. Is there much cross over between these two jobs and would you like to combine the two in the future? I trained at university as a landscape architect, but during that time I found that my passion lies within graphic design. Landscape Architecture is extremely important in terms of how we shape our environment but often the work produced in this discipline is poorly presented. Funding for landscape projects often lies on the landscape architects presentation to the client, and so the way in which their ideas are portrayed graphically is hugely important. So yes, I believe there is a strong crossover between the two disciplines and one that is often not fully exploited. We see you’re also based in this great city of Sheffield, do you see Sheffield as a pioneer city for all things creative? Like for instance the new brand ‘Designed in Sheffield’ which hopes to bring more creative jobs into the area. I think Sheffield is a great place for all kinds design, especially with its rich steel heritage. I know a lot of different creative’s based in Sheffield and they all enjoy working here. The thing that I love about Sheffield is the fact that it’s got everything a big city should have, as well as being so close to the peak district. It’s perfect for encouraging all kinds of different and varied design. I can see you’ve spent some time working on the interior design of a nightclub in Sheffield, please tell us some more about this. I’ve always loved music and clubbing and the electric atmosphere that comes with it, so it was a real honour for me when I was approached by the legendary Sheffield nightclub called Niche to be part of their ‘rebirth’ in 2009 after nearly five years since the original venue closed. I was always aware of the immense pressure to deliver on this particular project;the club had such a strong following within the city, and indeed the rest of the UK. Over the previous 20 years or so, it had become somewhat of a musical phenomenon leading the way at the forefront of one of the UK’s biggest underground music scenes. It even received a gold disc for sales in excess of 100,000 copies of both the ‘Ministry of Sound and Niche present The Sound of Bassline’ albums, so the pressure was on! The main room was designed to have a distinctly underground and dark feel, yet still retain a fresh and exciting vibe to bring Niche firmly into the modern era. 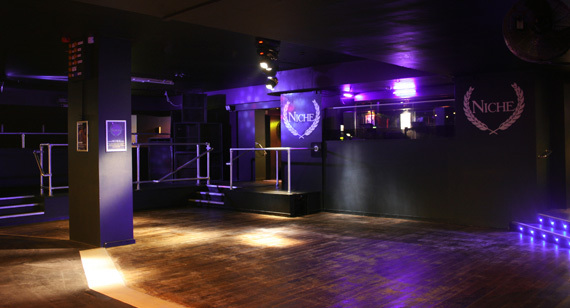 It was extremely important that this room set the right image for a venue that would play host to the fast moving and ever changing face of the underground music scene that Niche was so famous for creating. The second room was designed around the idea of an ‘original Niche replica’. 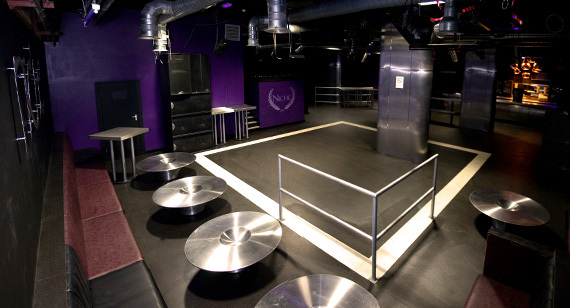 It was to host Niche anthems and original speed garage classics so it was important that it reflected many of the memorable qualities of the original Niche all-nighter venue. I worked closely with the people behind the Niche brand, often visiting the original building on Sidney Street to get a taste of the true intrinsic underground value of the venue that made it what it was. I was there on the opening night and the feedback from the clubbers was amazing, many of them saying that ‘they were back home’. That made all the hard work worthwhile. Do you have any little pearls of wisdom from the design world that might help our audience? Neat websites, shortcuts, helpful software etc. I think that the most important thing that any designer can do is to keep your eyes open. Design is everywhere and you should try to look at the detail in everyday items. Try to analyse everyday objects that have obviously been designed by someone. There are good and bad examples everywhere of design everywhere and understanding the difference between these is extremely important. What would be your dream project for Steel Ink Design to land? Re-designing the 2012 Olympics logo springs to mind! Absolutely anything! Right now while Steel Ink Design is still relatively young, I think rather than an individual project, it would be great to be able to collaborate on a project with some of the designers that inspire me. If I were to have to pick one, at the moment it would be Matt Pyke of Universal Everything. I’ve been inspired by some of the work that he’s created recently, and I admire the way that he works. I think that everyone can learn something from working with other like-minded designers. What do you see as the next big thing around the corner in the world of graphic design? I thinkiPads(and other similar tablets) will start to play a bigger role in everyday life. Not just for the graphic designer and the way in which a designer works on projects, but also in the way that information and design is delivered to users. I don’t think they’re quite there yet in terms of taking over, but they’re starting the advance quickly. I can see them eventually replacing laptops as an all in one computer. So for me, it’s very important to start thinking about how graphic design projects can make use of new technology to effectively reach and make a greater impact on the end user. Thanks for interviewing me. You can have a look at my latest work on my website and social networking pages.